If 65th and Foster Road doesn’t conjure up signature cocktails in your mind, but rather Oly in the can, you might pay another visit to this up-and-coming yet still gritty couple of blocks. You’ll find Bob & Alice’s gone, but among the veteran bars that remain are some newer establishments including Gemini Lounge. Shake. Served up. Garnish with cinnamon and nutmeg. Shake. Served up. Garnish with nutmeg. 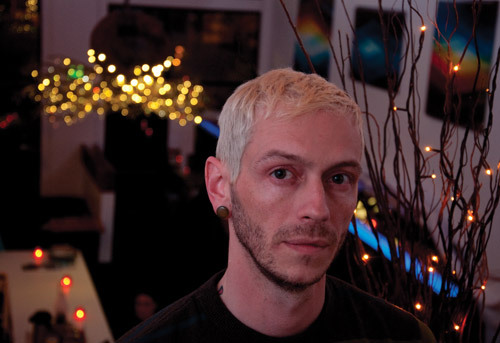 Alex Carlson’s Lightbar on SE 14th and Morrison opened its doors in August as a therapeutic oasis of light in the often dreary and dark Pacific Northwest. 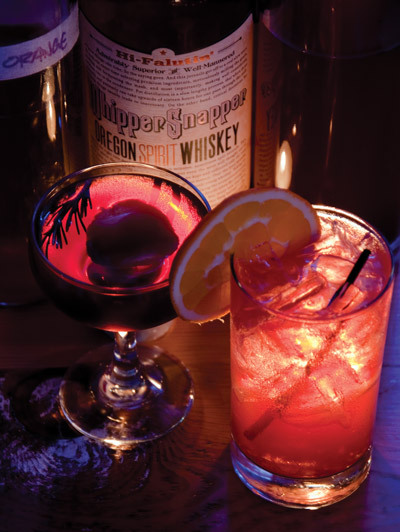 They are certainly an alternative to the many dimly-lit pubs in town and employ a team of mixologists who specialize in crafting Old World cocktails using New World (and local when possible) ingredients. 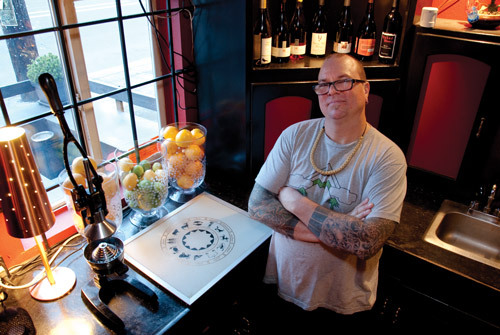 We visited Lightbar and General Manager Jason McKelley, a fifteen-year veteran bartender. McKelley mixed up two cocktails for us: a smooth, smoky rosemary Manhattan and a fruity, exotic elixir called 12 Tigers. While the former is well within the wheelhouse of the amatuer mixologist, the latter is doubtful something most of us want to try at home, mostly because of the herbs that need to be imported from Thailand and slowly infused into neutral spirits over the course of a month. Fresh rosemary. From your neighbor’s herb garden. Hold a smoldering cedar chip underneath an upside-down cocktail glass and allow the smoke to waft over the inside of the glass. In a cocktail shaker, add the bourbon, around a half-teaspoon of rosemary leaves and sweet vermouth. Dry shake (without ice) to infuse the rosemary into the spirit. Fill a pint glass with ice. Pour in the spirit mixture. Stir to dilute and to cool the mixture until the spirits and the ice reach the same level in the glass. Strain into the cedar-smoked cocktail glass. Add a black cherry. Squeeze a small piece of orange peel over the drink to let the oils from the peel fall into the mixture. Rim the glass with the peel. Add a couple drops of bitters. In a pint glass add whiskey, 11 Tigers aperitif, and bitters. Add ice to top of the glass. Stir until ice and spirit are at the same level in the glass. Fill a second tall glass with ice. Strain the spirit mixture into the glass over the ice. Affix the orange slice to the rim of the glass. Top off with club soda and sprinkle a dash of grated ginger root onto the surface of the cocktail. 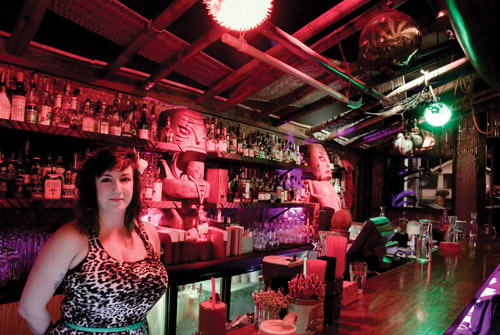 Mindy Kucan, Director of Education at the Oregon Bartenders Guild and Lead Bartender at the Polynesian-themed Hale Pele, presides over a Tiki bar stocked with 120-plus different brands of cane spirits (the most common type is known to the casual imbiber as rum). 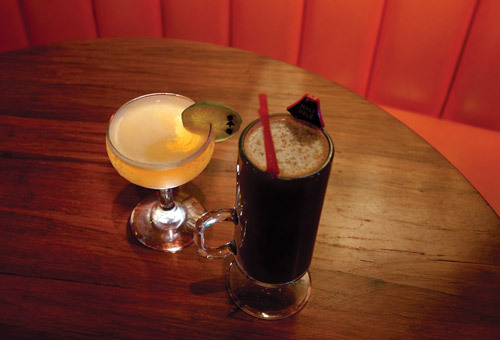 Kucan crafted two distinctly different holiday drinks for us to try — a hot, coconutty and chocolaty drink called Witch’s Brew and a wintry-spiced version of a daiquiri that Hemingway himself would be quite impressed with. Blend ingredients in shaker and shake for 12 seconds with cubed ice. Fine-strain liquid into a coupe or cocktail glass, and garnish with a lime wheel studded with cloves. Stir or mix all ingredients with a milk-shake maker and pour into a toddy glass. Garnish with freshly grated nutmeg.